alaTest on kerännyt ja analysoinut 139 arvostelut tuotteelle Fujifilm X-T20. Keskimääräinen antama arvosana tälle tuotteelle on 4.6/5, verrattuna keskimääräiseen arvosanaan 4.3/5 kategoriassa Digitaaliset kompaktikamerat. Me analysoimme käyttäjien ja ammattilaisten antamia arvosteluita, tuotteen ikää ja muita seikkoja. Verraten muihin tuotteisiin kategoriassa Digitaaliset kompaktikamerat, Fujifilm X-T20 on saanut alaScore™-arvosanan 95/100 = Paras. The mirrorless Fujifilm X-T20 delivers the same image quality and focus capabilities as the pricier X-T2, but drops weather sealing and some other pro features to hit a lower price point. 24MP APS-C X-Trans III image sensor. 8fps burst rate. 14fps with electronic shutter. Big, sharp EVF. Tilting touch LCD. Loads of physical controls. Film Simulation options. 4K video capture. Wi-Fi. Omits in-body stabilization and weather sealing. No dedicated focus select control. Shooting buffer could be larger. 4K footage suffers from rolling shutter effect. 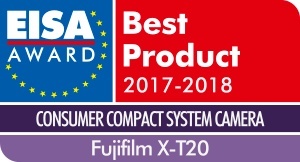 For 2017, Fujifilm has updated several of their popular X-series products, including the new X-T20. The replacement to their X-T10 from 2015 - a well liked ILC of its time - Fuji has made some expected improvements for a new 2017 mirrorless ILC. The Fujifilm X-T20's biggest issue is nothing to do with its own performance: it's the presence of the Panasonic Lumix G80, which can be bought with a lens for the same body-only price as this Fuji. That makes for a tough decision. 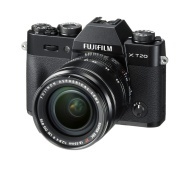 The Fujifilm X-T20 is a compact, mirrorless consumer camera that produces sharp, clean images and 4K video quality at a competitive price. At the heart of the camera is its 24.